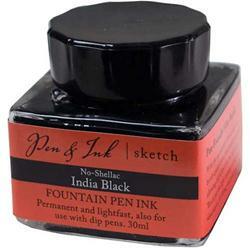 Available in a 30ml pen-friendly filler bottle, No-Shellac India Black Ink offers the ultimate sketching experience. It is a pigmented black India ink that is water-based, permanent and lightfast. Once dry, it does not bleed when used with a watercolor wash. It is also suitable for use with dip pens. The display measures 6-1/2"w x 4-1/2"d x 2"h (6-1/4"h with header) and accommodates six bottles of ink.